A chapel by Peter Zumthor, a red brick gallery by Herzog & de Meuron and a São Paulo museum by Linda Bo Bardi are among the subjects of 20 images shortlisted for architecture photograph of the year. The Arcaid Images Architectural Photography Awards 2016 aims to highlight the expertise of specialist architectural photographers. The 20 shortlisted photographs will be exhibited at this year's World Architecture Festival in Berlin between 16 and 18 November, with an overall winner announced during the event's gala dinner. The judges for this year's award are executive editor Emily Booth of The Architectural Review, curator Amy Croft curator of Sto Werkstatt, Katy Harris who is head of communications at Foster + Partners, architect Kai-Uwe Bergmann of BIG and photographers Fernando Guerra and Ulrich Müller. Photographs are shortlisted under four categories: Exteriors, Interiors, Sense of Place and Buildings in Use. Photographer Laurian Ghinitoiu is shortlisted for this shot of Sou Fujimoto's Forest of Light installation, which was created for the clothing brand COS at this year's Milan design week. Another in the running for the Buildings in Use category is this image of Coop Himmelb(l)au's angular Musee de Confluences in Lyon taken by Fabrice Fouillet. 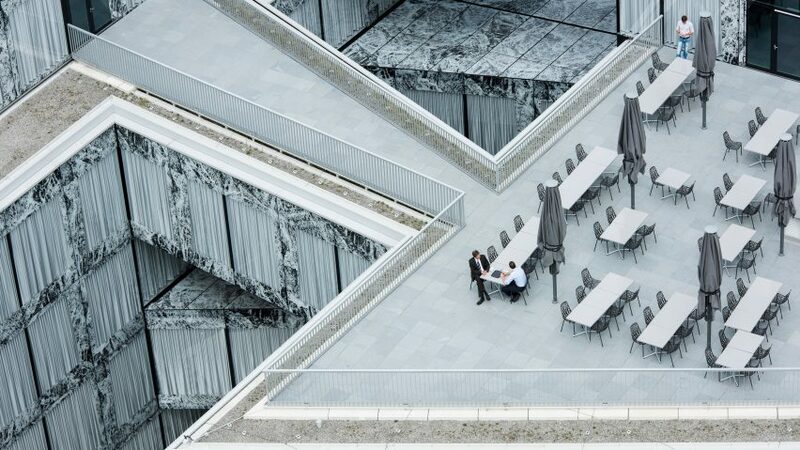 Two men making use of the roof terrace at the Allianz Headquarters in Zurich were captured in this photograph by Adrien Barakat. The building designed by Wiel Arets Architects features a fritted glass facade designed to mimic the pattern of onyx marble. Julien Lanoo frames a woman sleeping below a canopy in Ghana's Independence Square in Accra for his entry. Lanoo is also shortlisted for photographs in the Exteriors and Sense of Place categories. The last of the five images shortlisted in this category is an image of Mumbai's Dharavi slum with a series of blurred figures in the foreground by photographer Torsten Andreas Hoffmann. Nick Almasy's shot of Shanghai Tower, designed by Gensler and Marshall Strabala, shows the twisting skyscraper shrouded in mist. Next up in the shortlisted entries for the Exteriors category is this image by Inigo Bujedo Aguirre that hones in on the board-marked concrete surfaces and striking red paintwork of Lina Bo Bardi's SESC Pompeia in São Paolo. Shot from the street, this image shows the Lattice House in Kashmir by sP+A Architects and was taken by photographer Edmund Sumner. The second photograph by Julien Lanoo to feature on the shortlist is this shot of Herzog & de Meuron's Vitra Shaudepot in Weil am Rhein, which was completed earlier this year. Sebastian Weiss frames a section of the observation tower at Helsinki's Olympic Stadium, which was designed by Yrjo Lindegren and Toivo Jantti during the 1930s. The 72.71-metre-tall observation tower is representative of a gold medal-winning javelin throw by Finnish athlete Matti Järvinen during the 1932 Olympic Games. Fabrice Fouilliet's shortlisted interior shot shows the bright white interior of the Jesus Church designed by Rafael Moneo for the Spanish town of San Sebastian. The layers of colourful plastic making up SelgasCano's 2015 Serpentine Gallery Pavilion tint two figures in this photograph by James Newton. The British flag features heavily in this image by Kilian O'Sullivan taken on the Queen's Birthday inside a home designed by Bell Phillips. This photograph by Matt Emmett captures the brick arches of the Covered Reservoir in London's Finsbury Park, which was designed by the East London Waterworks Company in 1868. The making of a helical staircase designed by Finkernagel Ross Architects is documented in this photography by Will Scott, which is taken inside a workshop in the English town of Littlehampton. This image by Victor Romero frames the illuminated Rossetti and Heerim Architects-designed Baku National Stadium against a pink sky. A couple seeking refuge from the Winnipeg snow pose for this photograph taken by Paul Turang and shortlisted for the Sense of Place category. The neon green pavilion designed by Plain Projects, Pike Projects and Urbanink was part of the 2013 edition of the annual Warming Huts competition. The concrete towers of a Serbian housing estate designed by Aleksandar Stjepanovic rise in the background of this shot by Inigo Bujedo Aguirre. The latticed bamboo arch of the seaside Haduwa Arts & Culture Institute in Ghana – designed by [a]FA [applied] Foreign Affairs – can be seen in the background of this photograph by Julien Lanoo. Peter Zumthor's Bruder Klaus Field Chapel in Mechernich-Wachendorf features in the final shortlisted entry, which is taken by Mark Wohlrab. Zumthor's chapel was also the subject of an image shortlisted for the 2013 Arcaid Images Architectural Photography Awards.